Home / Finance / The Best Format of Mutual Funds: Statement or Demat? 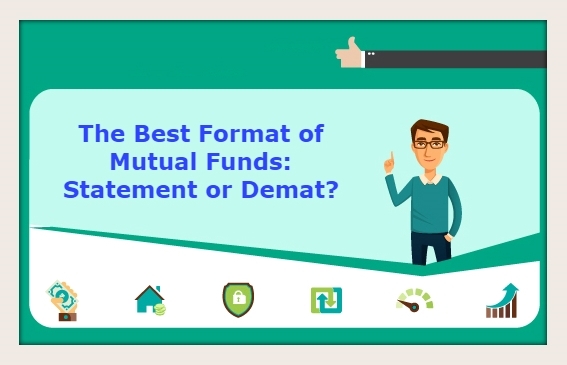 The Best Format of Mutual Funds: Statement or Demat? Demat refers to an account in which an investor can hold shares and securities in a dematerialised, i.e., electronic format. Demat account works just like a bank account. Instead of holding money, you hold securities electronically in your demat account which are debited or credited accordingly. The Depositories Act in 1996 made investing in shares easier with the introduction of the demat account. Read on to know more about demat accounts and how it facilitates trading in the mutual fund! An investor can use their existing demat accounts for converting mutual fund units in dematerialised form. If you have mutual fund units in physical format, which are represented by Statement of Account (SOA), you can convert this SoA into dematerialised form in your account with a depository participant (DP) of NSDL (National Securities Depository Limited) or CDSL (Central Depository Securities Limited). For instance, let’s say that your portfolio of mutual fund has 40 units of company A, 25 units of company B, and 90 units of company C. All these units will be displayed in your demat account so that you don’t have to maintain any physical certificates (SOA) proving that you own these units. As you buy and sell the mutual fund units, they will be adjusted in your demat account. Just like a bank statement, the DP will give you with recurrent statements of your transactions and holdings. Do note that dematerialisation of financial holdings is not mandatory, and you can hold your securities either in physical form or demat form. There is also an option to keep part of your holdings in demat form and part in physical form. However, a selected list of shares and securities declared by SEBI (Securities and Exchange Board of India) can be operated only in the demat form in the stock markets. With the launch of open-ended systems which enabled investors to purchase mutual fund units in partial or in full, purchase additional units as well as invest in a systematic investment plan (SIP), mutual fund organisations started publishing SOAs. This was also done to enhance the convenience level and reduce the paperwork. The statement of account (SOA) is an improvised physical holdings method utilised by mutual fund houses. This form of holding is similar to the holding of shares in demat form. In a demat account your financial securities, including debt instruments, mutual funds, equities, etc. can be monitored all through a single platform. SOAs are exclusively for mutual funds and gives detailed information with regard to transactions in a particular project. It also presents relevant details including the current investment value of an investor's folio, load charges etc. which are not provided in a demat account. Which Format To Choose As an Investor? If you buy ETFs (Exchange Traded Funds), holding mutual funds in demat form is a better idea as these securities can be purchased and sold only through the exchanges and a demat account is mandatory to do so. Moreover, the demat account scores over the SOA when it comes to transmission of units i.e., transferring units from a deceased unit holder's account to his/her legal beneficiary. The demat account can transfer units through a process referred as an off-market transfer. The concerned beneficiary will have to open a new demat account in his name, present a copy of the deceased unit holders will, death certificate along with other required documents to get the units transferred. Thus, the main advantage of holding mutual funds in a demat account is the ability to transfer units. When it comes to holding liquid fund units, It is more favourable in SOA as the crediting and consequently, the debiting of units requires additional time in case of demat format as it is performed at the DP's end. The liquid funds held in SOA format facilitate selling and buying on the same day. The systematic transfer plan (STP) option is also not available in the demat account. However, units held in demat account permit an investor to do SIP and switch between schemes of the same fund house at the same time. Demat account has several advantages as it helps to consolidate all of the investor’s securities and gives an idea of investments in a single snapshot, rather than having to go through various statements issued by different mutual funds. Holding mutual fund units in the demat account enables an investor to maintain a portfolio better, as you can monitor all the schemes at one place. Plus, buying and selling in dematerialised mutual funds units is faster and simpler!